I love summertime as it is a great season of the year that we can be outside enjoying our time with family and friends. With just little of a month to go in this season, we are spending almost every weekend entertaining outdoors. Just last weekend we had 22 people over for a backyard barbecue! Looking for some easy-to-prepare appetizer recipes that are delicious? 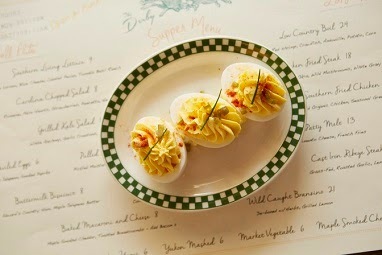 These deviled eggs are perfect for any summertime get-together. Grab the information and recipe below. Enjoy! Hard boil the eggs and cool completely. Once cooled, peel and slice the eggs lengthwise and reserve the yolks in a medium mixing bowl, or bowl for a stand mixer if available. Add the remaining ingredients and whip with a whisk or whisk attachment for mixer. Rinse the eggs whites in cold water to clean and refrigerate. Place yolk mixture into a pastry bag with a medium star shaped decorating tip. Chill in refrigerator for 30 minutes. Arrange the egg whites on a serving platter, add some pickled jalapenos into each one, then pipe the yolk mixture on top. Garnish with a more jalepenos, chives, EVOO, and a pinch of smoked paprika. Place diced peppers into a quart container. Bring remaining ingredients to a boil then cool until just warm. Pour over peppers and cover and place into refrigerator for at least 2 hours or overnight. 1. Wear gloves when cutting peppers, and wash cutting board before preparing other foods to avoid the residual heat spreading. 2. For a smoother yolk mixture-pass the prepared yolks through a tamis-or fine mesh strainer- before putting into the pastry bag. 3. Pipe a pea sized amount of the yolk mixture on the platter and place egg white on top to keep them stable when passing for large parties. Disclosure: The recipe and photo is courtesy of The Derby restaurant. It is now open on New York City's Lower East Side. The recipe is from Executive Chef Jeff Kreisel, formerly of Pounds and Ounces. Jeff created an updated southern-inspired menu with delicious classics like homemade buttermilk biscuits, cinnamon buns, chicken and waffles, house made pimento cheese, and light southern fare like salads with fresh peaches and strawberries.